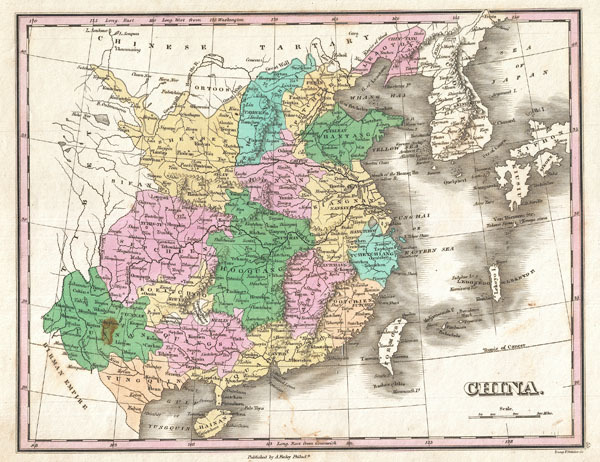 A beautiful example of Finley's important 1827 map of China. Covers the region from Chinese Tartary in the north to Hainan in the south. Includes the north Vietnamese empire of Tonkin (Tungquin), Korea, Formosa or Taiwan, and parts of Japan. Shows the course of the Great Wall. Identifies numerous cities, river systems, deserts, and mountain ranges. Title and scale in lower right quadrant. Engraved by Young and Delleker for the 1827 edition of Anthony Finley's General Atlas. Very good condition. Minor discoloration in the lower left quadrant. Original pressmark. Blank on verso. Rumsey 0285.056 (1831 edition). Phillips (Atlases) 4314, 760, 752, 6045.